Featuring female chefs from Newfoundland to St. John’s, this is the Fogo Island Inn’s third annual Chefs on the Edge weekend. It’s our third Chef Dinner too and we couldn’t be more appreciative of the experience again this year. Previous weekend menus indicated the names of each chef responsible for a course. The lack of assigned names implied to me more of a collaborative approach to plates but where I’m aware, I’ll try to indicate chef’s names who lead on or prepared each course. I was assured by one chef that all hands were involved in all plates and Chef Lynn Crawford was ‘boss’ but from what I saw, this looked like a team in and out of the kitchen. Oops! Over zealous! This WAS Herring Cove Pork Rillettes, Wild Cover salt cod brandade and apple chutney. Served with flaked salt cod, mustard and a pesto or slaw. 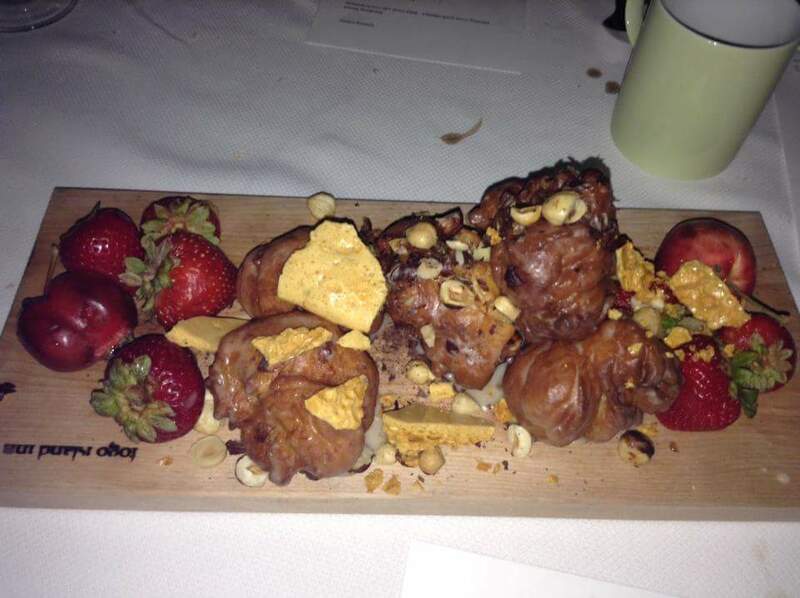 It WAS also thoroughly enjoyed at our table of nine with a board served to each end of the table. 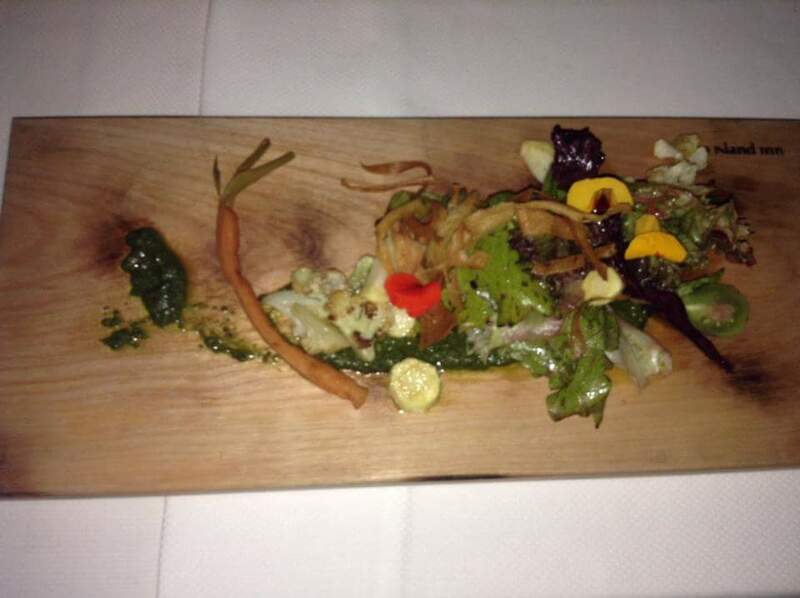 This dish was inspired by the visiting chefs but was prepared by the Fogo Island team of chefs. 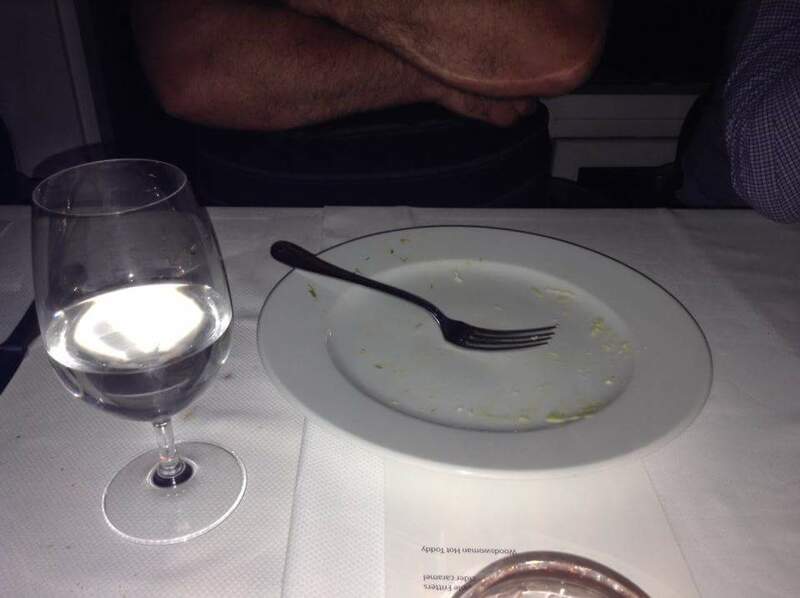 It was our first course and I was unable to get a picture without a hand going for a bit more. This was also served with delicious tiny rolls made by Katie Hayes from the Bonavista Social Club. The rolls were delicious with the rillettes and we quickly cleaned out the bread basket too. Buckle your knees and then unbuckle your belt! Mushrooms, greens and caribou moss harvested this morning. Mushrooms and toast. 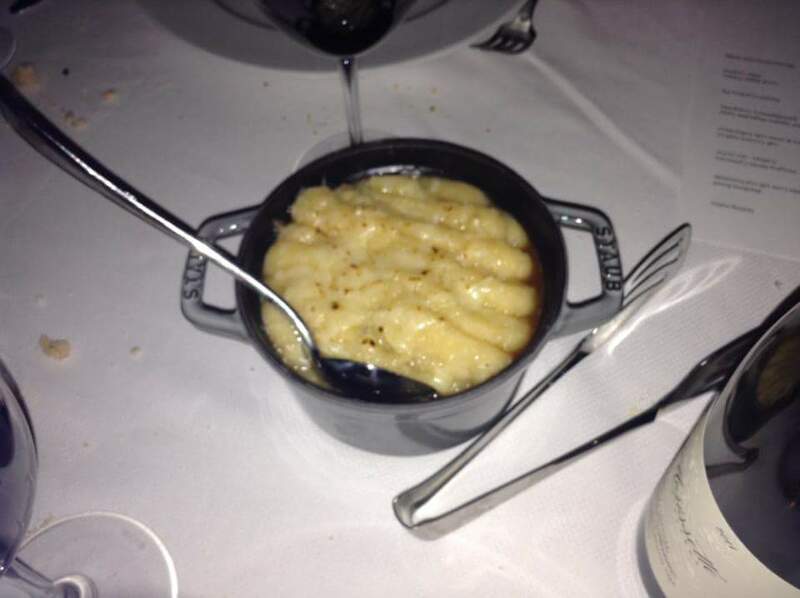 Already, all guests at our tablet are best friends having shared this delicious experience. The chefs foraged berries and mushrooms in the morning and took them from ground level to heavens-sent by the evening. 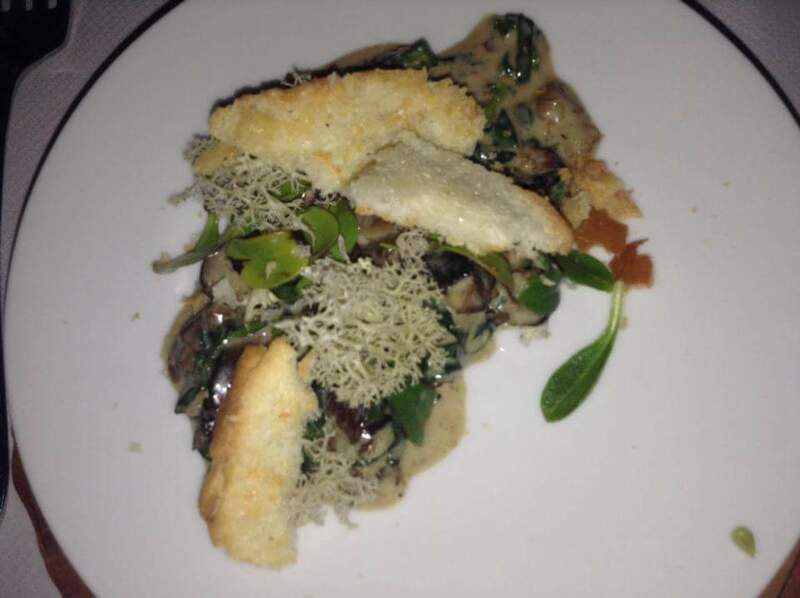 Chef Lora Kirk’s mushrooms and toast lead it audible reactions of delight and excited glances to the menu as this was an extra course added to the six in print. A table guest told us as the dish was being developed he watched Chef Lynn Crawford and others taste and advise as the final plate was designed. I wish I’d thought to make a visit to the kitchen to see this team at work. 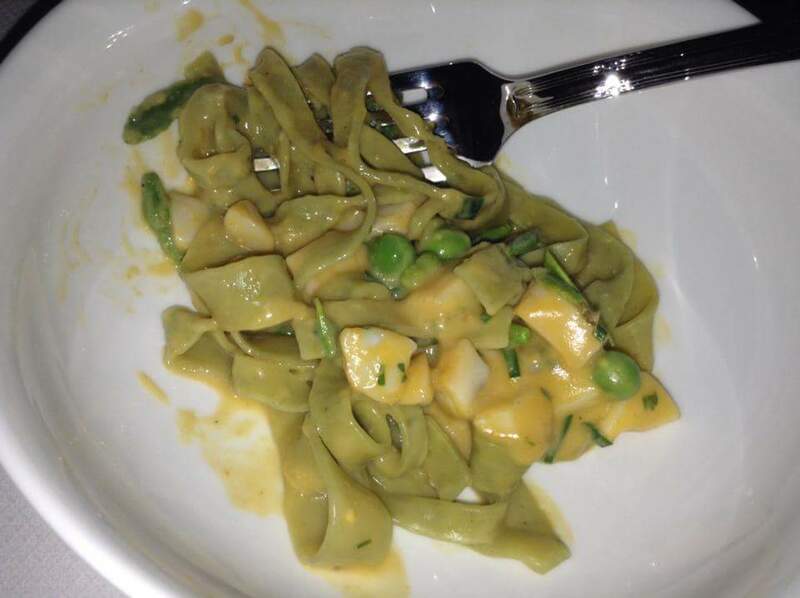 Stinging Nettle Carbonara with scallops and sea urchin. The company and conversation had me enjoying before I remembered to take a picture! Again! It was plated so beautifully before I dove in! While Chef Emma Cardarelli was lead on this plate, other chefs did preparation like smoking the scallops. The Fogo Island Inn and Shorefast Foundation support the schools in various ways, including fundraising for the playgrounds. A school garden was harvested with students and chefs on Friday. 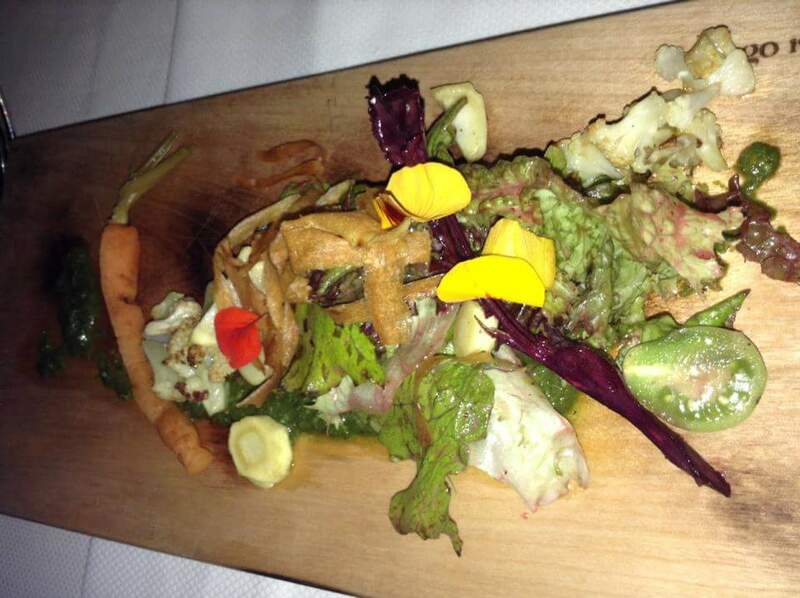 This salad prepared by Chef Katie Hayes features some of those vegetables, as well as greens and flowers from her own gardens in Upper Amherst Cove, NL. A delicious salad with Partridgeberry vinaigrette was number four in our eight course evening. 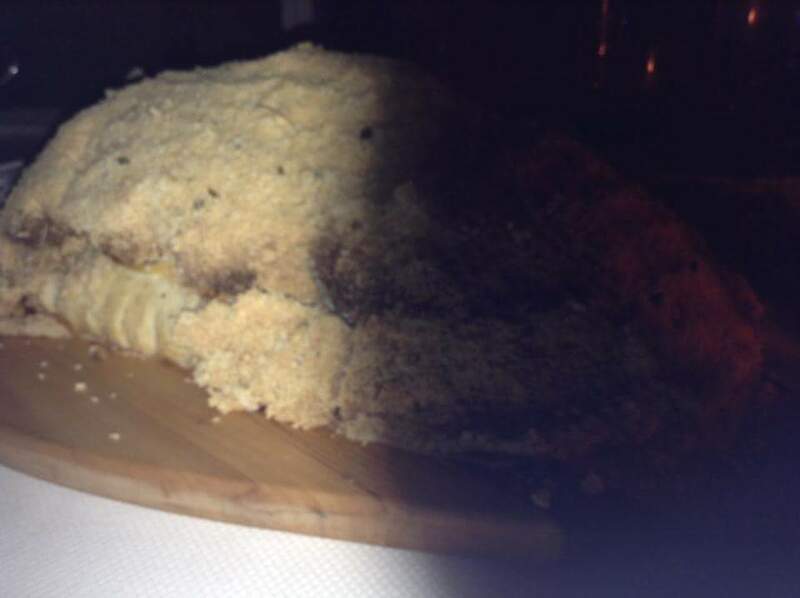 With apologies for picture quality (my four year old Samsung Galaxy Tablet has recently failed and my Ipod did not do justice to the colours or textures of these plates) this is a salt encrusted halibut. 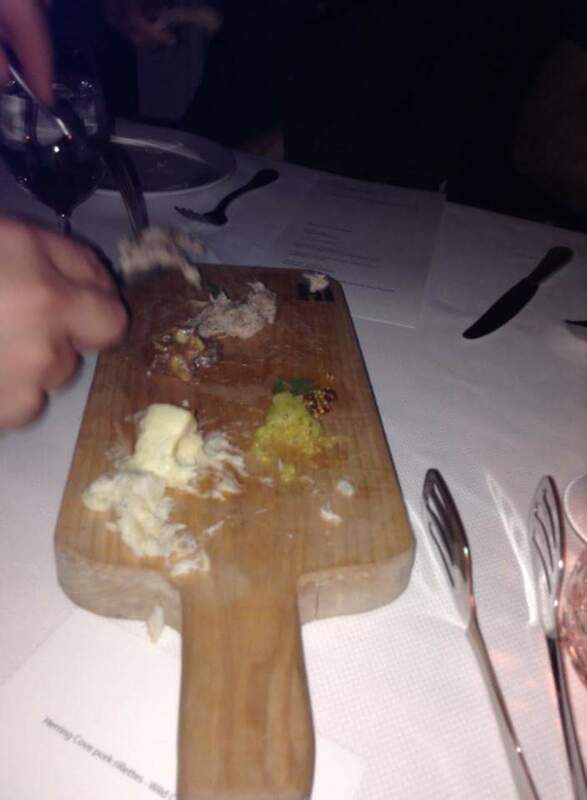 The halibut was prepared by Chef Lora Kirk (restaurant Ruby Watchoo, Toronto) and cracked at the table with the wooden mallets used for preparing iceberg ice at the bar of the Fogo Island Inn. The crust featured vines from Creeping Snowberries, a rare berry on Fogo Island. 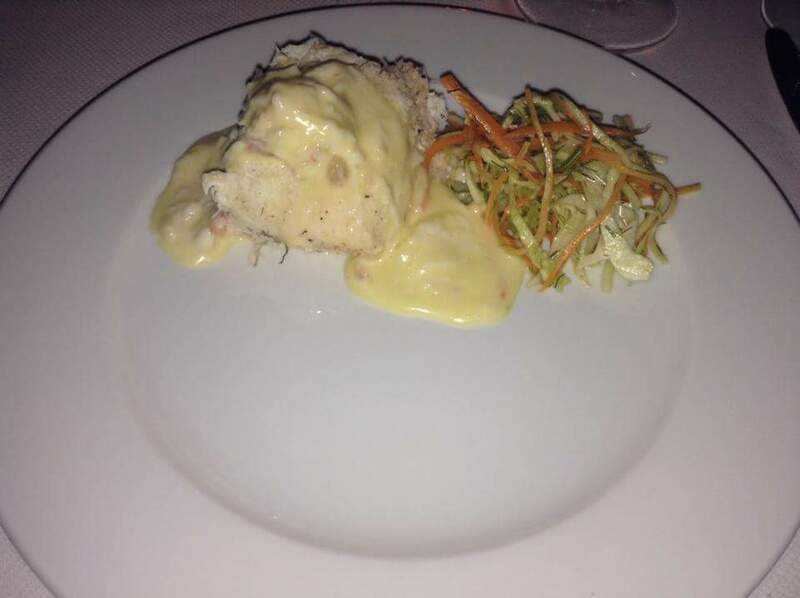 A slaw of fresh root vegetables and crab hollandaise sauce was served with this course. The snowberries were featured in the hollandaise sauce with large meaty pieces of crab. 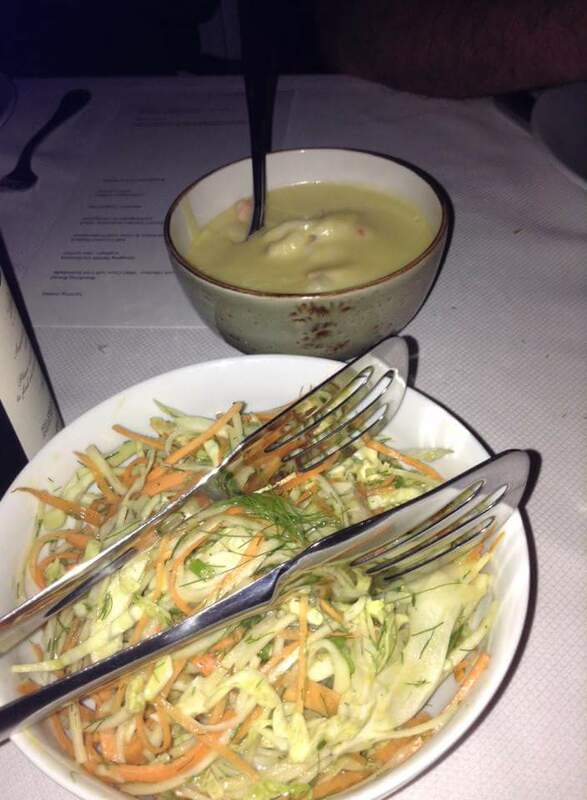 Again, with two large platters and slaw and sauce served to both ends of the table, diners kept going back for more. On huge charger sized plates, this may not look like a large portion but it was rich and delicious and we all went back for more. Each end of the table was checking to see if the hollandaise was all gone. Not because the portions were small, just because we could not stop ourselves from having seconds. It was at this point that we lost one diner at our table who was not able to continue eating after such a long day and five courses. I called dibs on his dessert immediately. 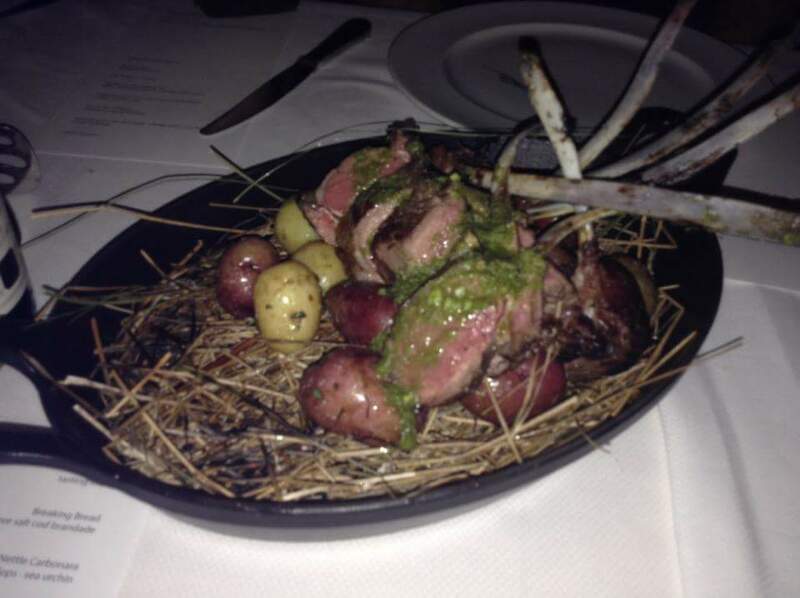 Chef Dana Hauser had intended on grilling her rack of lamb on an open fire outside the Inn. Mother Nature did not co-operate and although the rain stopped mid afternoon, high winds made an open fire beside a large wooden building a non starter. Chefs Hauser and McDonald cut hay near the Inn and served the lamb with hay smoked potatoes. 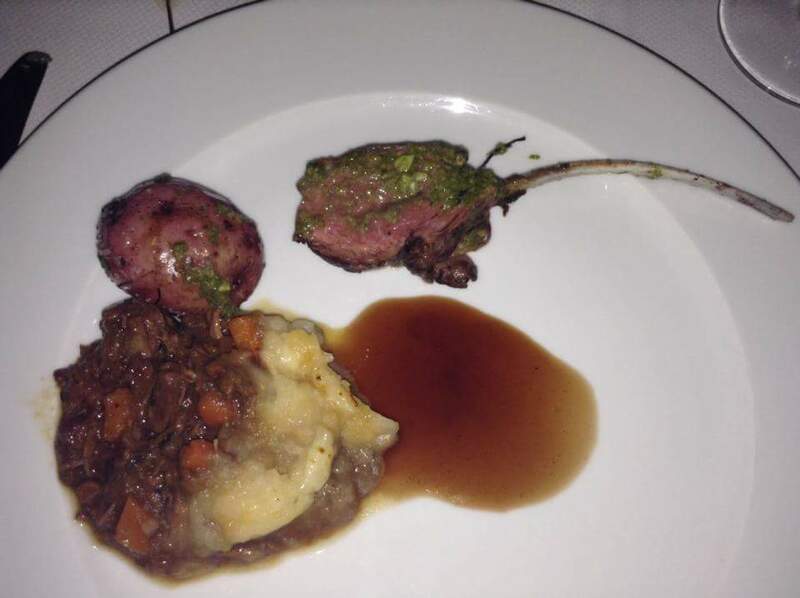 We also had Hunters Caribou Pie prepared with local game and fresh vegetables. Diners not only went back for the second rib but also lamented that if we could, we’d save those potatoes for hash browns in the morning. A typical Newfoundland meal where you are eating and planning the next occasion eat. Inspired and devised by the guest chefs dessert was served with a Woodswoman Hot Toddy made of juniper, spruce and Labrador tea. 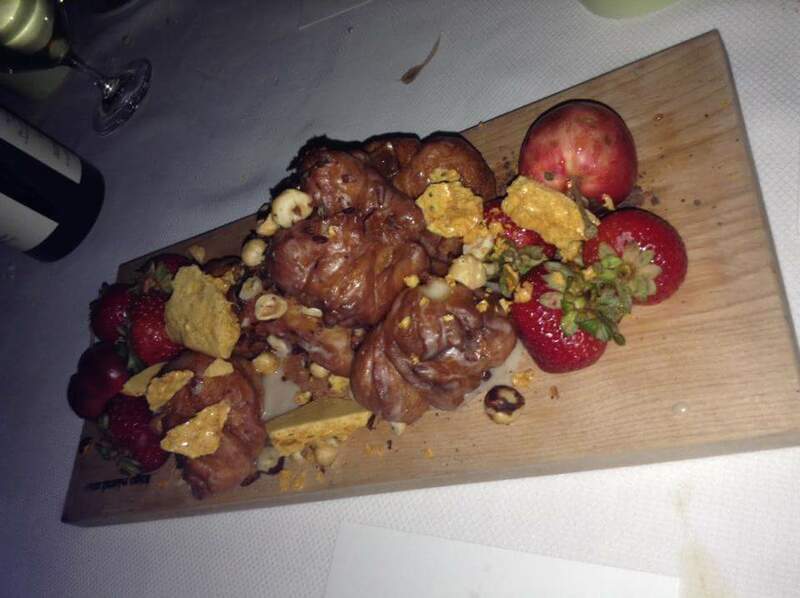 The Fogo Island Inn pastry chefs Kara and Savannah prepared Apple Fritters served with a cider caramel. The apples came from Zita Cobb’s tree. Can’t get any more local than that!